Grading currently either takes me a huge amount of time, or gets done in an extremely cursory way. It occurs to me that, if my students were able to submit code into some sort of autotester, they would find many of their errors before I review their code. This would mean that I would only have to look for clarity issues, not logic bugs. I am interested in software that (a) isn't too hard to set up, (b) will allow my students to test whether their code is (at least) to spec, and (c) allows me to quickly cycle through the code from all of the students in a section to look for style issues. I have looked far and wide, and have not yet found a reasonable system that accomplishes these three goals. Many universities seem to have robust systems, but they all appear to be home-grown, and unavailable to outsiders. Is anyone aware of such a system? I honestly don't even care if it costs money - I just need a solution that makes this task more reasonable. For simple stuff I've used CodingBat. They've got an authoring system buried on the site. It's not terribly difficult to create your own questions, although the instructions are pretty wordy. When you create a problem there are a set of fields to fill in. I'd attach a screenshot, but the network I'm on blocks imgur. I'll try to come back and add an image later. This is the instructions that your students will read. List as many test cases as you want. Separate each parameter that you want to send into the method you're testing with a comma. The expected answer comes at the end. It looks like this for the method below. 123 goes into sumEvenDigits as n and then 2 is the expected answer. code Starter code for your students. 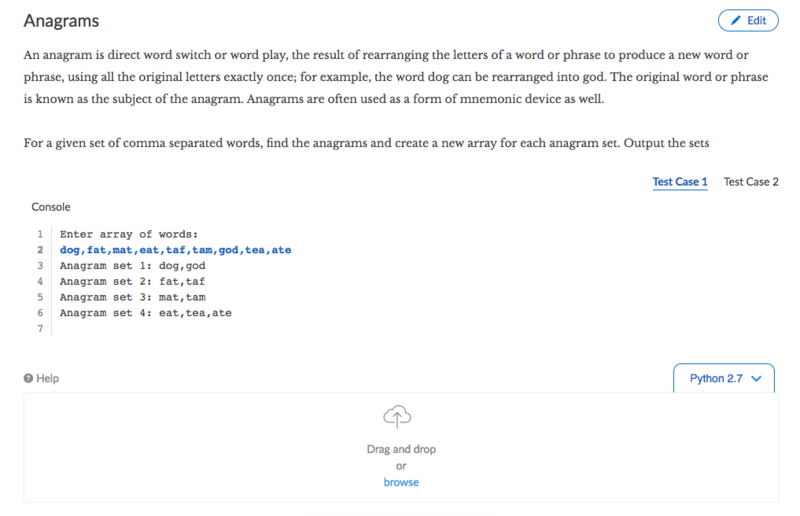 tags Let's you put questions into categories, specify language, and set a difficulty. I use VPL (Virtual Programming Lab) for Moodle. In my case, it is just used for the introductory PHP classes (since HTML and DB interactions aren't possible), but it supports a wide range of languages, including Java. If you have Moodle available in your school, it is just a matter of installing the plugin. Then you're able to create your own tasks and define test cases in plain-text files. Everything is available from the activity interface itself. If you know a bit of shell script, it is even possible to perform more checks on the code, including style checks (you can even deny a submission if it doesn't match your criteria). VPL also supports automatic file comparison for plagiarism detection. I would recommend repl.it classroom It allows creation of a course and assignments within that course. Assignments can be auto-graded using unit testing (JUnit) or by providing inputs and comparing expected outputs against actual outputs. Students get feedback on what test cases passed and which did not. These can then be converted directly into student grades. The developers are really responsive -- I've had several conversations with Amjad Masad on Twitter -- and they take feedback seriously. There is an authoring page that shows how to write your own problems. I've found this to be the easiest of all the tools I've tried when it comes to creating my own assignments. Someone has written an Grading tool for CodeCheck and Canvas that downloads the uploaded jar files, allows you to comment on them locally and then uploads the grades back to Canvas. I found, however, that simply browsing the PDF printouts was more effective for me. Disclaimer: I am one of the authors of this free service. Labs: small, bite-sized questions to help students get familiar to a new concept. Students work in AutoGradr's web IDE and get instant feedback. Projects: suitable for more complex questions where students can work in their own IDEs (Visual Studio, Eclipse etc.). They upload their solutions to AutoGradr and get instant feedback. AutoGradr provides instant feedback to students allowing them to know their mistakes and make a better submission before it ever gets to you. AutoGradr provides report on code quality to both students and instructors. Students can make newer attempts to improve their submission. Instructors never have to write code to automate the grading. AutoGradr projects have test cases that define what the program output must be. Test cases can either be visible or hidden. Test cases can contain user input via stdin or files. Students can write to files and have them automatically tested. AutoGradr's instant feedback tells student how their output differed from the expected output. They can make multiple attempts to fix any issues. Students and instructors can see report on code quality. Students can fix their code quality issues and make newer submissions. We've been using Web-CAT. It's ok. It certainly motivates students to read error messages more closely. I remember having difficulty determining exactly where my unit tests were supposed to be uploaded; there's a user folder and an assignment folder, and one something's in the wrong place it's hard to just move it. In three years, I still haven't found how to get it to accept "Type arrayname" as opposed to "Type arrayname"; students hate losing those two points. Students sometimes have to click around a little to find report details, and the UI doesn't always make clear what's clickable. Note: I'm one of the founders of CodeHS. If you check out CodeHS, we have a system for writing autograders using Java. You can write unit test specific problems that test the output of a specific method or write generic autograders for any Java program if you want to test more complex things. Not the answer you're looking for? Browse other questions tagged java grading auto-graders or ask your own question.